Grace Lawn Cemetery is the final resting place to many Beardsley family members, including Elizabeth, Albert and Ruth Beardsley. 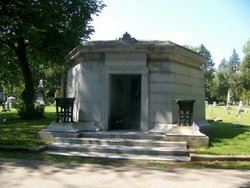 Come see the Beardsley family mausoleum and listen to local folklore and history, as we traverse the site where our ancestors now lie. There will be two sessions, 4:30pm to 5:30pm and 5:30 - 6:30pm, on Saturday, October 27th (with rain date scheduled for Sunday, October 28th), and the tours will end inside the Beardsley Mausoleum. Paths will be lit, but please bring your own flashlight for safety purposes. Following the Historical Cemetery Tour will be the haunting Ghost Hunt at Grace Lawn for those 18 years and up. Space is limited to 15 people per session, so sign up now. Ruthmere Champions, Doug and Sharon Beardsley, are generously supporting the Cemetery Walk to help reduce admission pricing. Contact vjohnston@ruthmere.org or call 574-264-0330 ext. 116 for more information.